Well if you want what was a roughie, Mullof Killough. William Hill got smashed overnight as did Oz bookies. Can't see why but it wouldn't be the first time an under the radar European has been successfully backed in. Not in this race though. Bradman wrote: Well if you want what was a roughie, Mullof Killough. William Hill got smashed overnight as did Oz bookies. 80 into 30 here and 50 into thirty over there. Just grab what you can get now and put it out of your mind whilst looking for a probable winner. I got Filoente for the MC at 28s back in March so feeling pretty good now. JGK wrote: I got Filoente for the MC at 28s back in March so feeling pretty good now. I bet Gai isn't after hearing that. Puissance de lune out of the MC. Needless to say, it was one of my long term bets as well. Stoopid pile of dog meat. where are his tips for the Cup? The one starting with V you mentioned a while ago; Gai's one and Hawkspur. I've got the first two in my box trifecta. What do you know about the other two? Actually that doesn't seem too bad.I got on VDC a while back and afer the barrier draw threw in Lloyd's trainer's "ticked all the boxes" two in Seville and Fawkner. Dear Demi to round out the tri and the first four. 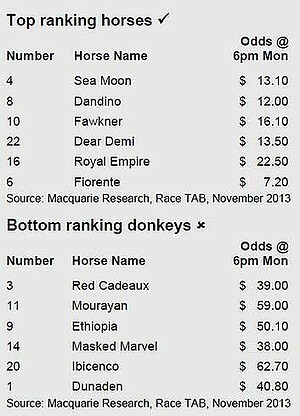 JGK wrote: I got Fiorente for the MC at 28s back in March so feeling pretty good now. Probably meant I ended up square after listening to that qunt Horrie. The Chief rang me all excited, exclaiming that she backed the winner (random pick by her boss at the TAB). I said it was the favourite so don't expect to be able to retire on the winnings. What did the winner pay? Looks like I had 1st, 3rd, 4th and 5th in top box First Four. Bad luck on the top 4.